Surrounded by legislative supporters and members of the Raise the Wage Coalition, Minnesota Gov. 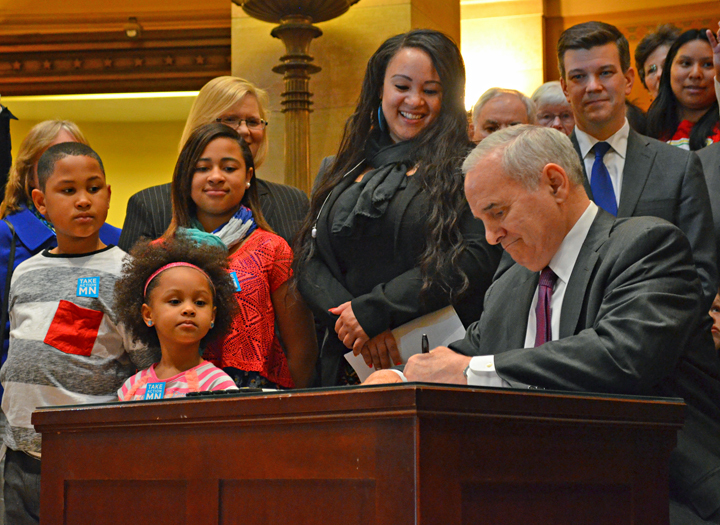 Mark Dayton signed a bill increasing the minimum wage to $9.50 by 2016 – and indexing it to inflation. Progress is what Minnesota Gov. Mark Dayton promised he’d deliver if given pro-worker majorities in the Legislature. Progress on job creation, better schools, economic justice and budget stability is what Dayton and House DFLers will point to when they campaign for re-election this fall. In the 2014 session, Dayton and legislators picked up where they left off last year, adding to their already-lengthy list of accomplishments for Minnesota’s working families, union leaders said. Before adjourning the session ahead of schedule May 16, lawmakers passed the first increase to the state’s minimum wage in a decade, and they agreed to invest $1 billion in job-creating infrastructure projects – both top priorities for the state’s unions heading into the 2014 session. But those accomplishments represent the tip of the iceberg when it comes to the full list of gains for working families. The minimum-wage increase – to $9.50 per hour by 2016, with indexing to ensure it keeps up with inflation – means more than 350,000 Minnesotans will see a raise. But Dayton and the DFL Legislature also passed wage increases targeted at workers in the health care industry. Nursing home workers will see their first wage increase in four years. Lawmakers also approved a 5 percent rate increase for community-based providers of in-home health care, stipulating that 80 percent of the increase must go to workers. The rate hike drew praise from members of SEIU Healthcare Minnesota, the union that, thanks to legislation passed in 2013, is working to organize home care workers into a statewide bargaining unit. The Legislature’s failure to raise the provider rate for in-home health services – it increased by just 3.4 percent from 2003 to 2012 – has been a rallying cry for home health workers looking to organize and gain a stronger voice at the Capitol. In 2013 lawmakers made a $525 million investment in the state’s public school districts, guaranteeing statewide access to all-day kindergarten. They also paid back more than $2 billion borrowed from districts in a gimmick to balance the state budget during the previous biennium, when Republicans controlled the Legislature. With funding stabilized, lawmakers moved in 2014 to make schools safer, passing the Safe and Supportive Minnesota Schools Act. It strengthens the state’s anti-bullying laws, which had been among the nation’s weakest, and provides more training to prepare school employees for dealing with bullying. The statewide educators’ union, Education Minnesota, lobbied legislators to pass the law, as did Local 284 of the Service Employees International Union, which represents school employees. Signed into law on Mother’s Day, the labor-backed Women’s Economic Security Act expands unpaid leave under the Minnesota Parental Leave Act from six to 12 weeks, and it makes it easier for mothers to stay in the workforce by providing new accommodations for pregnant and nursing workers. The new law also takes measures to close the pay gap between women and men, including a provision requiring large employers seeking state contracts over $500,000 to prove they are paying men and women equally for doing the same job. • What didn’t lawmakers accomplish? Transportation is the most pressing issue left unaddressed by Dayton and the DFL majorities, union leaders acknowledged. Needed investments and the state’s roads, bridges and transit systems stayed on the back burner at the Capitol in 2013 and 2014. 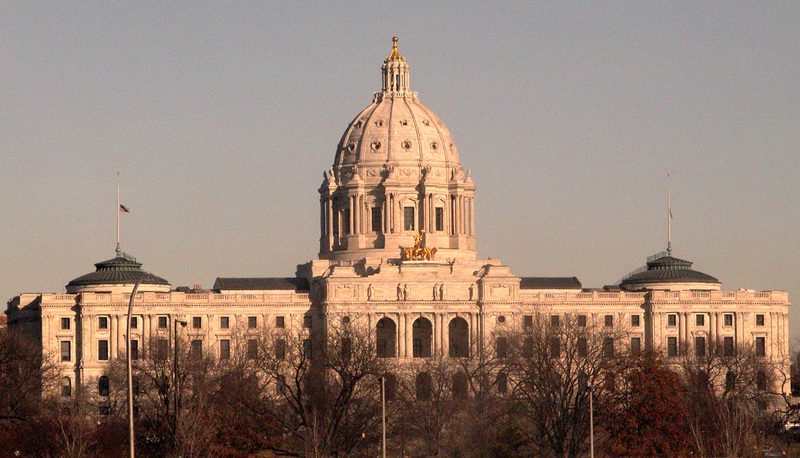 Will Dayton and DFL House members have an opportunity to take up that challenge in 2015? Knutson pledged an all-out effort to see them re-elected. “Union members will be working hard in the coming months to ensure that Gov. Dayton and a DFL legislative majority return to continue the work of building a better Minnesota,” she said.